Hello, I've been working on my first major 2600 project, and decided to post about it here just to see what people think about it. 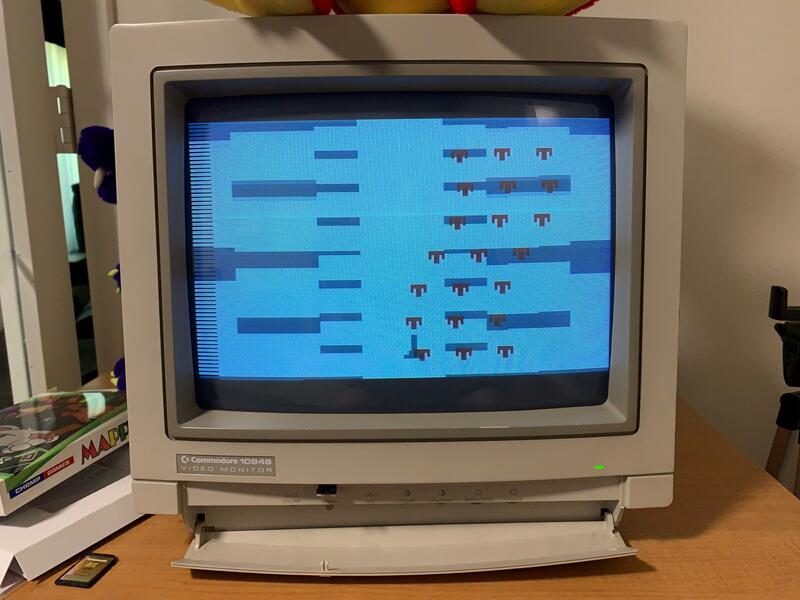 It's a vertically scrolling shooter for the 2600 running on a stock 4k cart. I don't have a harmony cart, so I've only had the opportunity to test it in an emulator, so apologies if it's not stable on real hardware. Edited by triggthediscovery, Mon Apr 15, 2019 6:33 PM. 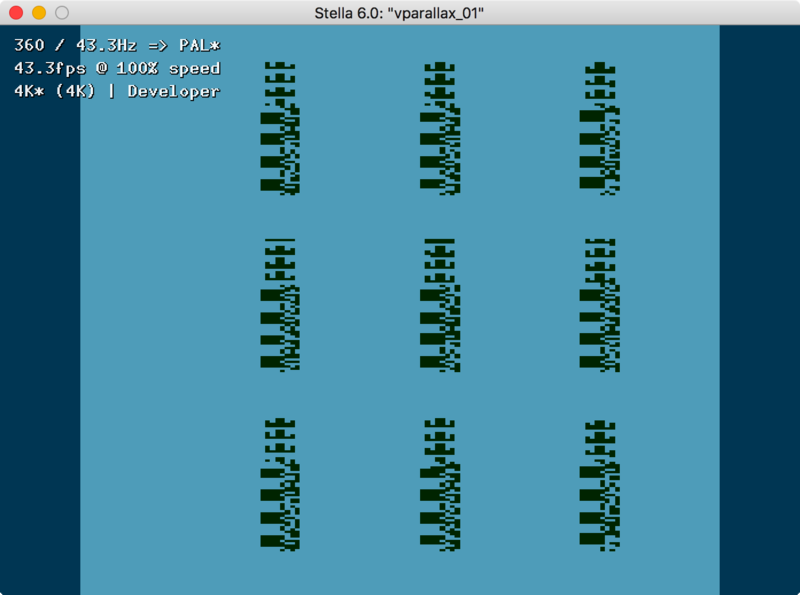 Could it be the beginning of a Galaga port to the 2600????? I don't have any words... The way you shoot, the 3D effect, the number of enemies, you made a really good job! If you could reduce the enemies to 20 and use that free time for calculating detections, that would be still impressive. That looks very cool! Can't wait to see how it evolves. Thanks for sharing! I like your use of the ball to free up both players for all the enemy. Picture rolls on real hardware. The VSYNC should happen after WSYNC, not before. 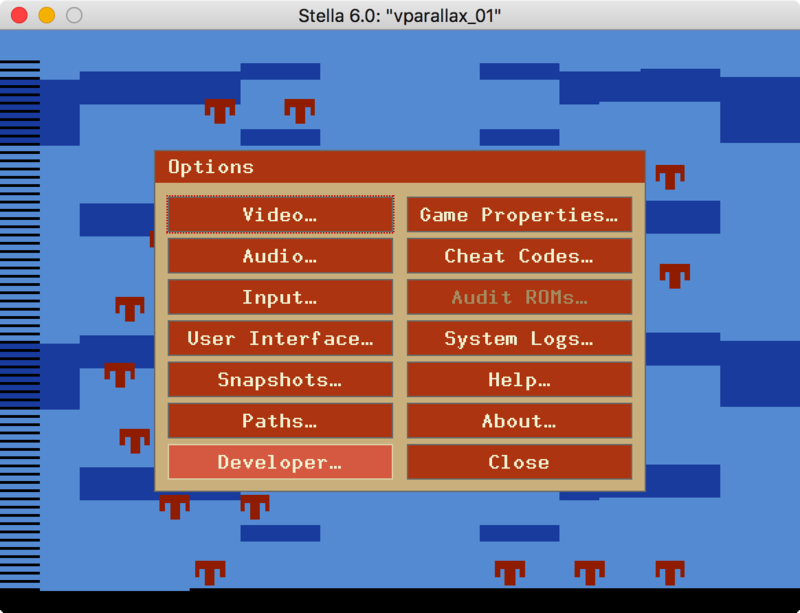 I hacked the ROM using Stella - besides the VSYNC WSYNC swap I also needed to move the lda #$00 sta VBLANK. 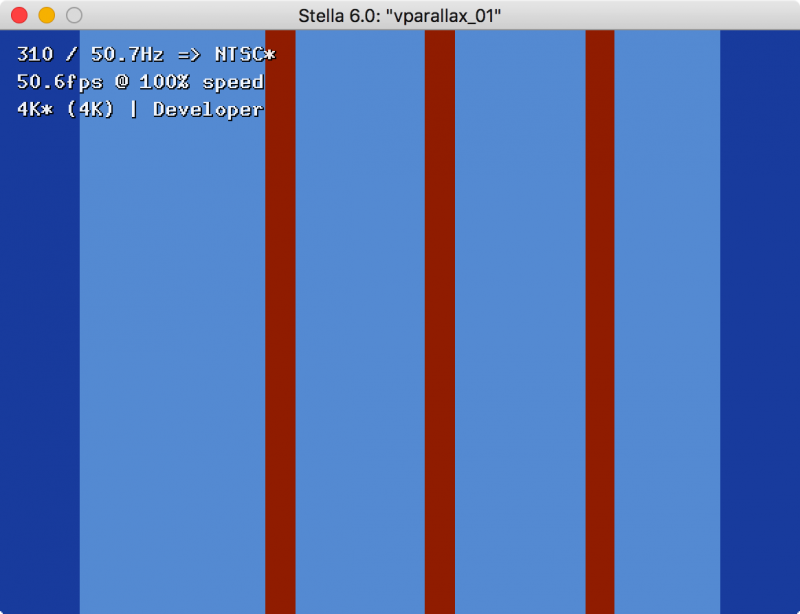 That should be done just before you start the kernel (drawing the visible screen), not during the Vertical Sync. Reason being is that will turn on video output, and the colors will interfere with the display's ability to detect the VSYCN signal. After that, the other thing I notice is the enemy only shows up on the right side of the screen. It was like that in the video, so it's not due to the hacks I did. For debugging purposes you should make each player a different color, which'll make it easier to figure out if the position problem is with player0 or player1. I also suggest you read at least the first few parts of my tutorial, you'll want to use the timers (as shown in Step 2) rather than a bunch of writes to WSYNC (as shown in Step 1). I apologize, I accidentally uploaded an outdated bin file! Thanks SpiceWare, I'm realizing I'm going to need a flashcart if I want to make sure it works properly on a real system. 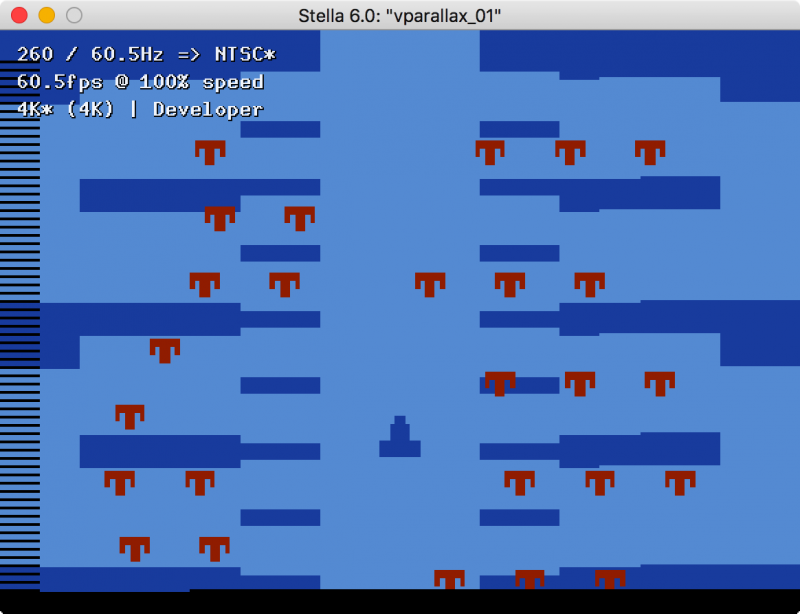 In regards to all my WSYNCs I might use the timer in the final version, but right now they were just the easiest way to get a stable game in Stella, I intend to hopefully use all that free CPU time for something fun. There's no question that you will use the timers, without them it's too difficult to implement game logic while also maintaining a stable display. Nicht sehr gut on hardware. Click Developer... which is the bottom left button, then select the Developer Settings radio button at the top. As a developer you really want to turn that on, it will expose bugs in your code that will show up on some, but not all, Atari consoles. One of the most common bugs is to leave off a # in an immediate mode instruction, aka typing in LDA $02 when you really meant to type LDA #$02. Same for LDX and LDY immediate mode instructions. The Harmony - I have both versions, the original and the Encore that supports larger games. One thing I like is games written to take advantage of the original Harmony's hardware (ie: utilize the ARM as a coprocessor) can be produced as stand along games by using the Melody board. Recent examples of what can be down with that are my Draconian and John's Mappy (check the videos). While you're not yet ready to create games like those, you will be in the future. The UnoCart supports larger games as well. My understanding is they're working on a version for standalone games, but I don't know when that'll be ready. Follow along with this topic if you'd like to keep up with UnoCart development, as well as where to buy one. For smaller projects you could also use a Starpath Supercharger, it'll support 4K games; however, it's around the same cost as the Harmony or UnoCart and not as easy to work with. You'll have to turn your BIN into an audio file and figure out how to play it into the Supercharger - games for it were sold on cassette tapes back in the 80s. I started out with one of these, but haven't used it in over a decade.